It’s tough to find anyone in the marketing world against evaluating social media for a marketing plan. Many brands have seen great success on social networks. In fact, it has completely redefined some. However, there are times when brands hop on the social bandwagon without much thought or planning. The result is a confusing, ineffective message that fragments marketing communications. Let’s head to Twitter where the Vitamin Shoppe is experiencing this fragmentation. Given that this company is such a well-known and large brand, one would assume its marketing plan on social networks is flawless and well-executed. 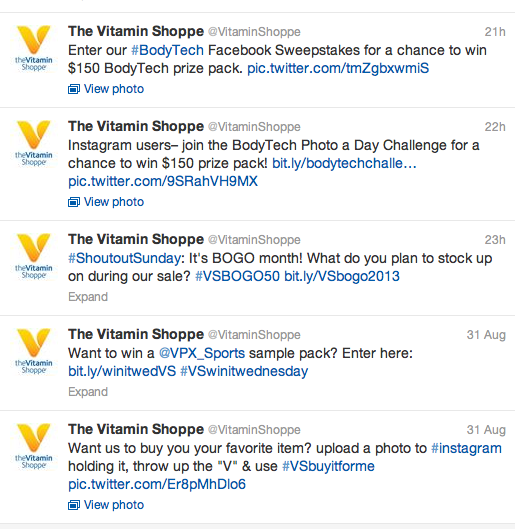 This is far from the case.With nearly 80,000 followers on Twitter, the Vitamin Shoppe is failing to engage with customers and communicate a well-thought-out brand message. Let’s look at the content the Vitamin Shoppe is posting on Twitter. The majority of posts revolve around contests. This could make sense, as many brands promote contests on social networks, which typically drive a hefty amount of interaction with customers. However, this is where the Vitamin Shoppe falls short. If we look at the contests promoted within just the last two days, you’ll see that at least eight different contests were being promoted. That’s right- at least 8. Why do I say at least? Because it’s extremely confusing for a consumer to understand what exactly the contests are. To make things even more confusing, many of these contests are being ran on other sites, like Pinterest and Instagram. So, not only do we have a brand promoting too many contests at once, we have a brand running contests on too many platforms at once. What does this do? Well, it doesn’t drive the consumer to buy. What’s even more concerning than the content being posted on Twitter? The timing of it. You’ll see that one tweet posted on a Saturday is promoting the hashtag #VSwinitwednesday. Wait a second? Why is the Vitamin Shoppe posting a contest that runs on a Wednesday on a Saturday? I understand the contest can take entries at any time, but this is only found out by clicking on the tweet. Any consumer just casually looking through their newsfeed has no idea this is the case. Finally, engagement on the tweets is low. For such a recognized brand and over 80,000 followers, you would think engagement would be high. That is not the case. Many tweets have very few, if any retweets or likes. This begs the question- what value is the Vitamin Shoppe getting from Twitter? Are their scheduled tweets doing anything? The Vitamin Shoppe could easily fix their marketing problem. First off, the company needs to consolidate their contests. Having so many run at once is confusing and fragmenting their marketing message. Consumers should be able to say “The Vitamin Shoppe is running a contest on Pinterest to win a $500 gift card, and every Wednesdays they give away a package of protein mix.” Consumers now know what to expect. The marketing communications promoting these contests becomes stronger and more effective because now instead of promoting eight different contests, you’re only promoting two. Finally, with a mix of better content and a more defined marketing message, the Vitamin Shoppe could see a large increase in engagement. Consumers need to find content relevant and consistent. The more you promote the same message, the more consumers recognize this message, and in turn, can take action against it. The target audience for the Vitamin Shoppe is there and is niche. This should be a market seeing much more interaction than what the Vitamin Shoppe currently is seeing.